Ten years on, Steven Spielberg’s (War Horse) 2002 biography movie, Catch Me If You Can, has its high-definition debut on Blu-ray. The second film pairing Spielberg with Tom Hanks (Road to Perdition), Catch Me If You Can tells the true life story of Frank Abagnale Jr. (Leonardo DiCaprio, Titanic), a young con man who passed himself off as a pilot, a lawyer and a doctor all before his 21st birthday. Hanks plays the FBI agent who tracks Frank across the globe. Christopher Walken (Kill the Irishman) plays DiCaprio’s father in the movie, which also stars Martin Sheen (Seeking a Friend For the End of the World), Amy Adams (The Fighter), James Brolin (Burlesque) and Jennifer Garner (The Odd Life of Timothy Green). 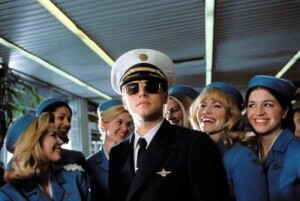 The script was written by Jeff Nathanson (Tower Heist), based on the book by the real Frank Abagnale Jr. and Stan Redding. The PG-13 film, which grossed $164 million in theaters, was nominated for two Oscars, for Walken as Best Supporting Actor and for John Williams’ original score.